I don’t like banana. So why is today’s recipe salted caramel banana bread? So, yeah, back to the reason you’re actually here. 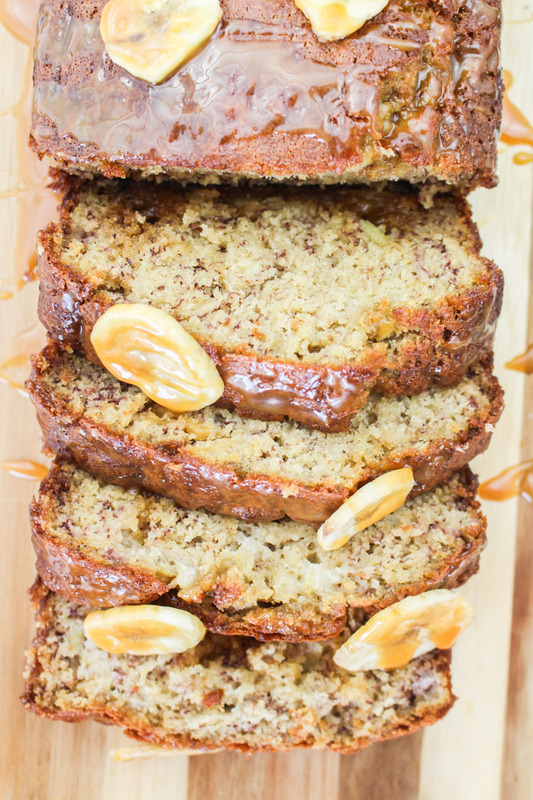 Salted Caramel Banana Bread. About a year ago, Katie requested that I make a toffee banana loaf, and to say it was a disaster would be an understatement. I went in way too heavy with the toffee, and it basically turned into a banana flavoured brick. We couldn’t even try and eat it, it was just too hard. And I promised her that once I had gotten over my toffee disaster, I would give banana bread another try. Not only did I get back on the banana bread horse, I also stood with my guns and added (a reasonable amount of) caramel too. And you will be pleased to hear it is exactly as soft and moist as I had dreamed it would be. Second time lucky! You can definitely make your own salted caramel sauce if you like – try this Cupcake Jemma recipe – or, like me, you can just go out to Sainsbury’s and buy some. I’ve had mixed results from making my own salted caramel sauce, and I didn’t want to ruin this banana bread for a second time with a dodgy batch. This is where you would usually expect to find my tips and tricks for making this recipe, but this time it’s so easy that I genuinely don’t have any words of wisdom to share. Don’t over-mix the batter is always a good one, but apart from that there isn’t much else I can give you. Just follow the steps below and you will be golden. 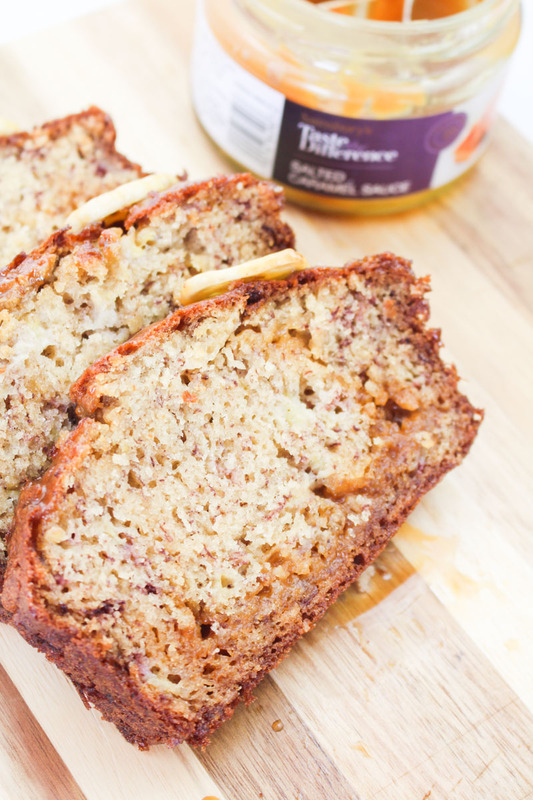 You really want to use ripe bananas for banana bread – the browner the skins, the better. 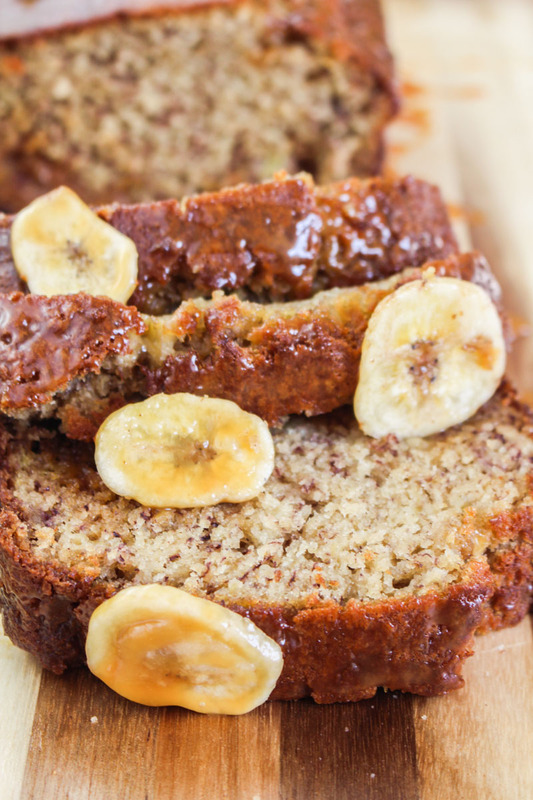 Make sure you plan ahead if you want to make this loaf, and buy bananas a week or so ahead. Alternatively, this is a great way to use up those overripe brown bananas you’ve had hanging around in the fruit bowl for waaaay too long. Let me know if you love this one as much as my other half does – and maybe I might get brainstorming another banana bread creation again before yet another year passes by. 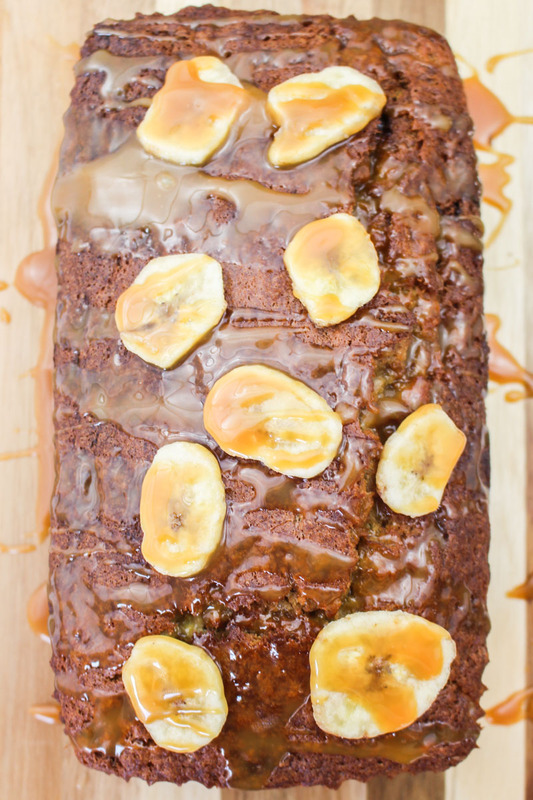 A classic banana bread, filled and drizzled with salted caramel sauce. Preheat the oven to 180°C / 350°F (160°C fan) and grease and line a 2lb loaf tin. Cream the butter and sugar together in the bowl of your stand mixer, or using an electric hand mixer, until well mixed and fluffy. Add the eggs, mashed bananas, and vanilla extract, and mix again well. Add the flour, bicarb, baking powder, salt, and ground cinnamon into the bowl with the batter, and gently mix together until just combined. The batter will seem a little lumpy, but that's fine. Spoon two thirds of the batter into the tin, and then dollop half of the salted caramel sauce around on top. Spoon the rest of the batter on top, and spread out evenly. Bake the banana bread for 50-55 minutes, until golden brown on top, and a skewer or toothpick inserted in the middle comes out pretty much clean. Leave to cool in the tin on a wire rack. Once cool, remove from the tin, top with some banana chips, and drizzle generously with salted caramel sauce. If the sauce is too thick to drizzle, heat it up in the microwave for 10 seconds or so. The banana bread will stay fresh for a week, if kept in an airtight container in a cool place. It will taste better a couple of days after baking! Drizzle with caramel sauce when ready to serve. The loaf can be frozen for up to four months, in an airtight container or bag. Defrost at room temperature overnight, and then eat within 4 or 5 days. It looks so fluffy like you could just snuggle into it!